Music plants stories, stories grow with music. Get ready to create your own story with Herr Ludwig ! Drama in Beethoven is a fun experiment to connect stories with Beethoven Sonatas. Developed as a CLASSICAL 4 ALL project, the show aims to create a direct and unique connection between listener and the classical music. “Music is just music! We are the ones who are labeling it with fancy halls and dress codes” says Ege Maltepe, an actress, playwright and a former student of Mike Nichols, right before diving into a bloody scenario along with the 2nd movement Sonata No.7. Emir Gamsızoğlu is a unique type of virtuoso, who started to play the piano at the age of 20, after quitting his career as a basketball player. He suggests using the help of stories about music and also making up your own stories on the pieces you listen or play. “I have my own relationship with music by visualizing stories or creating dialogues while I play. I ended up having scenarios that go along with pieces” This technique gives depth and color to Gamsızoğlu’s interpretation, but it’s also a great way to connect with classical music as a listener. “I think it opens a door in your imagination, you become a child again! It sets your imagination free of labels, and through that freedom you can have a direct relationship with music. This is a paradox; we give classical music such an importance, which is great, but eventually it becomes so “important” that people think they won’t understand classical music, because it’s complex. There is nothing to not to understand and they just miss an amazing legacy!” adds Maltepe, happy to be developing this project since 2010. Learn about how Beethoven is related to Shakespeare and how his love to Countess Guicciardi influenced him to compose the Moonlight Sonata and how can a musician creates his own stories through music. 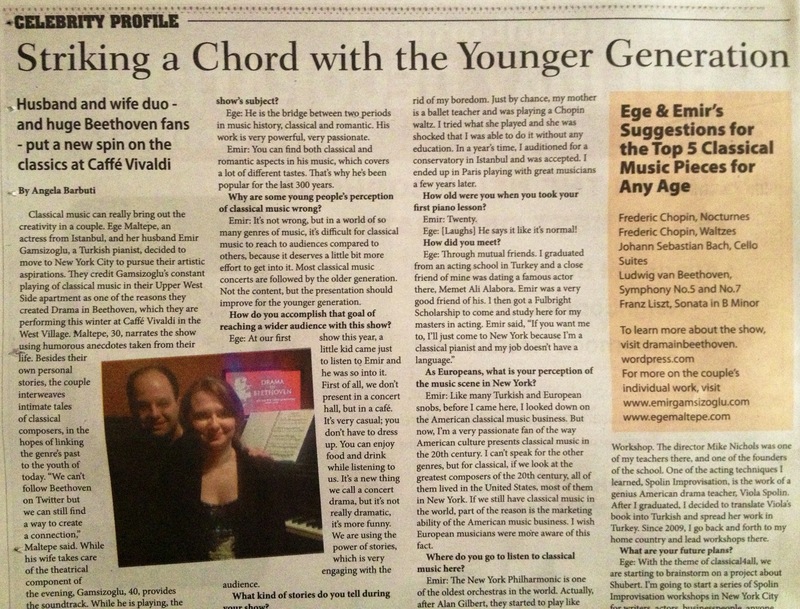 Click here to read DRAMA IN BEETHOVEN’s story and a great interview with the artists on NY Press.